Once you start typing any keyword to the search engine, you may notice that the search engine offers you suggestions that you might want to search for. This function is called Autocomplete and it is a great thing, not only for users but also for marketers. Users save time when writing and thinking about how to formulate a search query. Marketers have a great tool in their hands for finding out about keywords that users are searching for. 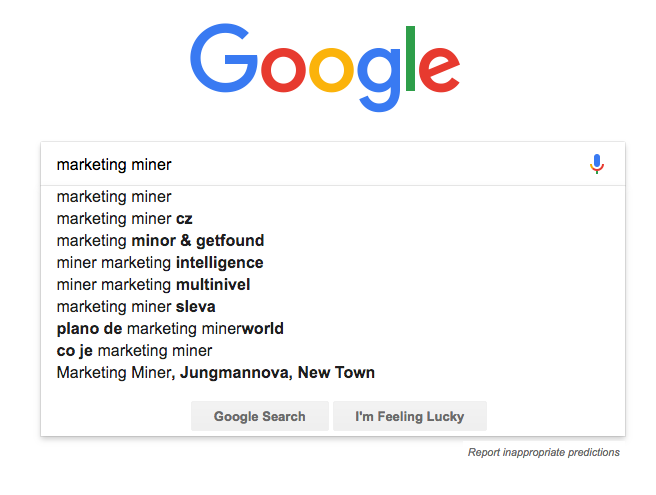 When you are a marketer and you want to avoid searching for these suggestions manually, you can use Marketing Miner that will do it for you. When working on keyword analysis. Suggestions from Autocomplete are one of the possibilities on how to gather your data. When writing a new article. When writing an article, you often do not need to make a comprehensive keyword analysis. Just have a quick look at the Autocomplete suggestions and you can find out easily what are the users looking for regarding your topic. You can also build the structure of the article around these keywords. When you are seeking inspiration for the new blog post. You can start typing different keywords into a search engine and find easily some new interesting keywords for a topic that you haven&apos;t write about yet. You can start typing queries like "How to", "Guide on", "What is", "What does it mean" and so one. When you are looking for any content inspiration. Whether for social networks or email. An Autocomplete will tell you what are your users searching for, and how they think while searching. When you need to check your brand reputation. You can easily check what queries are users searching for regarding your brand. For example, if a word like "scam" appears in Autocomplete within your brand, you would want to know about that. You can also check whether you have a landing page for each keyword that the users search for. Let Marketing Miner work for you and save time by typing phrases into the search engine manually. TIP: You can combine this Miner with Miner AdWords Suggest. Get started by clicking on Create report button and specifying Keywords at the input. We recommend that you have a pre-determined set of basic keywords to which you want to get suggestions for. Then type or copy these keywords into the clipboard. In the Keyword prospecting section, click on Miner Suggest. After clicking, you can set up what data you want to get from this Miner. Broad match. For example, if you type "SEO" in the search engine, a broad match will include keywords that contain letters "SEO" anywhere in the word. You can find, for example, the city of "Seoul" in South Korea within the results. Exact match. 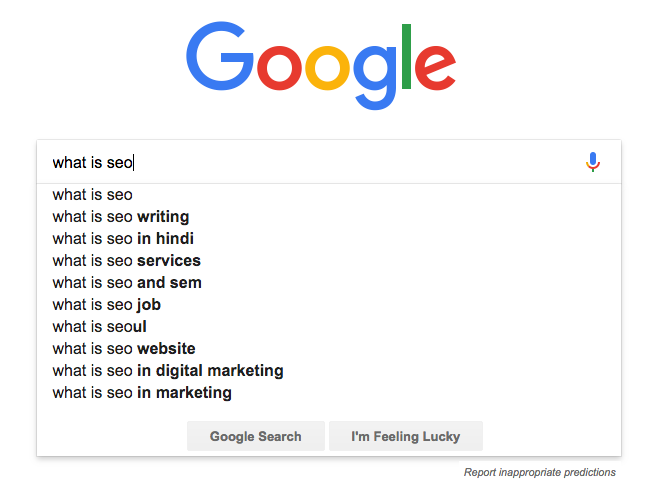 But when you type "SEO" in the search engine, you will only get expressions that contain the word "SEO" in the exact match. 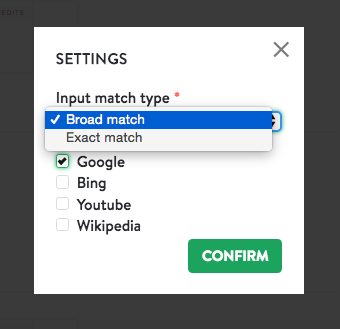 Let&apos;s look at one more example of how to distinguish broad from the exact match. Marketing Miner found these suggestions for keyword "coin" in exact match. 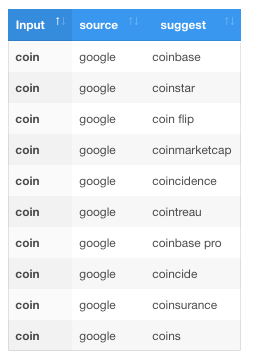 Marketing Miner found these suggestions for keyword "coin" in broad match. If you&apos;re done, just click on Get Data to start processing your inputs. Keyword: The keyword you wanted to get suggestions from. Source: Source from which the suggested keywords were downloaded. You can use suggested keywords for keyword analysis, content inspiration, creating blog post structure, or create a new landing page on your site.